I’m seeing no I squandered this title gag on a potential future article called “Mo Mana Mo Problems” which may also be a past article, in which case I guess I didn’t squander the gag as much as fail to repeat it. Regardless, last week I wrote an article called “No Data No Problems” and I guessed at a lot of cards that would go up as a result of some of the Legenday creatures in Battlebond. I guessed pretty well. Let’s see how much better we do this week with (some) data. I bet we do better. Do you bet we do better? Better bet we do better. 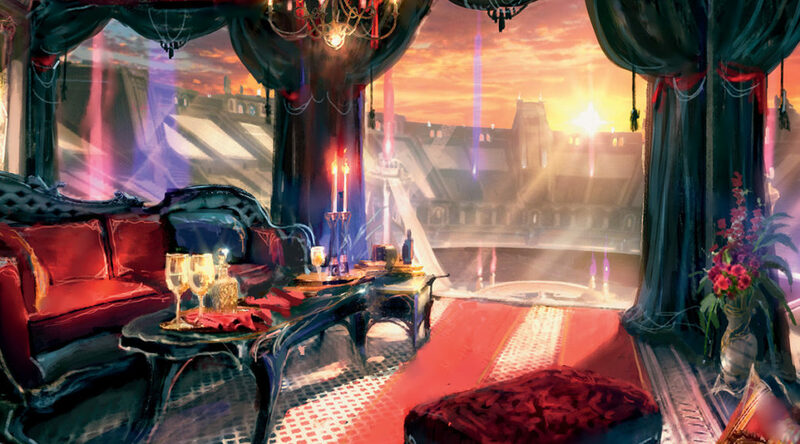 The decks from Battlebond that matter appear to be contained to what we covered last week because we managed to guess the only deck that anyone seems to care about. So it looks like Najeela is the only deck that matters so let’s take a crack at it, I guess. 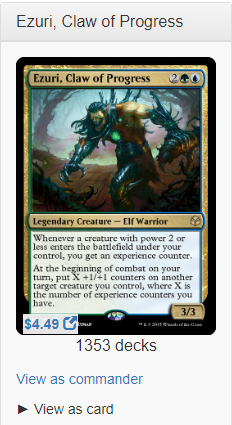 I’m sure people are building the Lannister Planeswalkers, Pir and Toothy and some other combinations, but Najeela is the high-impact, immediate card to address. We covered some Najeela picks last week and I think with the data we get from EDHREC, we should be able to mop up the rest. We have a few more targets to look into now that there is data. Mirri is a solid pick if you ask me. Most people don’t know but the inclusion of Herald’s Horn makes the Kitty Cat deck currently the highest-valued deck. It’s also one that people aren’t super jazzed to bust as players which means the copies aren’t getting into the market as easily. You have a recipe for a card on the move and I think Mirri is a very solid place to park some money. 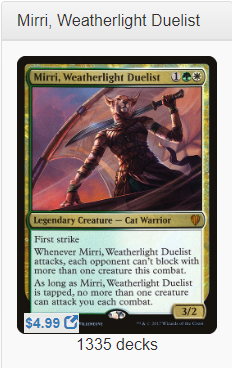 Decent in the 99 and a good commander in her own right, Mirri is an important part of Najeela as well and could have some upside. Her Najeela inclusion stats are strong (65% of 40 decks, but 65% seems strong to me, as much as I’d like a larger sample size). I think this may be a better pick than some of the cards I mentioned last week, although I still feel very strongly about Druids’ Repository. I feel good about this one, and the price is starting to pick up, here. The dealers are really keen on this card lately. You can buy a lot of copies since it’s an uncommon, but the ceiling on an uncommon from this block is significantly higher than that of most sets and this is a great warrior inclusion. I don’t know if you need to buy foils per se since the non-foil looks so strong. 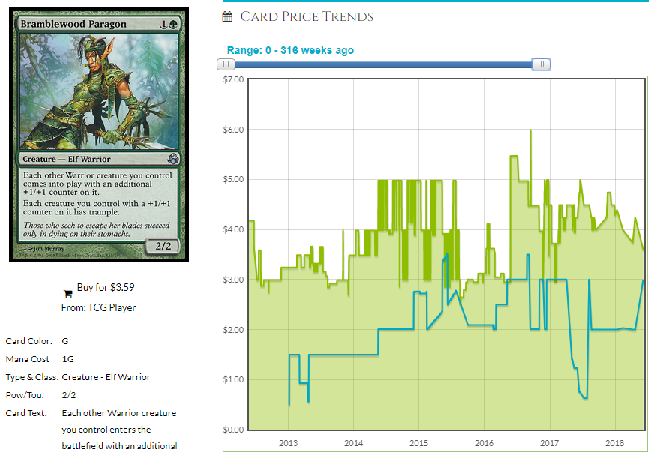 I think the divergence of the non-foil price from the foil price shows that there is genuine, recent, strong demand for the non-foil rather than slow, inevitable growth of an older card. EDH players don’t foil decks on a large scale and the foil getting neglected shows that there is promise for this card. That said, foils tend to price correct just on principle so while I’m not a huge fan, I think you might make money just because a foil not being worth at least twice a non-foil is so psychologically unsatisfying for people that you probably just make money. It’s a little hard to tell what’s going on here. 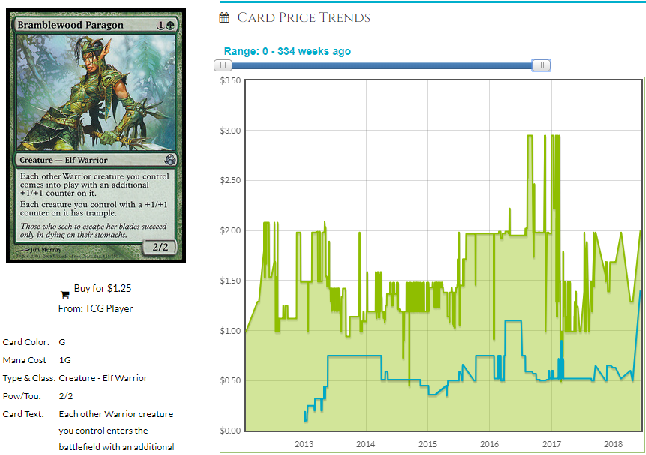 The last year shows some pretty good growth and it’s only getting better based on demand from new decks that have access to this based on it being in a precon and being a bulk rare people could easily grab for a while (still almost can) and it being a Warrior, which suddenly matters. I like this quite a bit and I think it has upside. 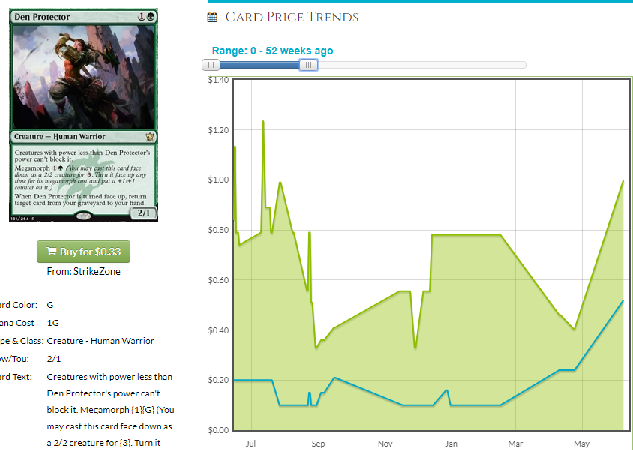 I also like lower-buy-in picks sometimes and I think you can grabble a big pile of bulk rares easily. This is mostly started to move and cheap copies (Card Kingdom claims this is $4.49 but it’s sold out at that price) but I would be remiss if I didn’t point out what is clearly the first big mover from the Najeela deck. I usually go more in-depth but I am in Vegas for the GP so I will keep this brief. Ruminate on these picks and if you need any clarification, let me know in the comments section. I’ll be back next week with a brand new piece, possibly informed by what happens here in Vegas. Until next week! I really like a couple of these picks. Managed to get my Ezuri for $5 🙂 I’d like to throw a couple into the mix…Throne of the God Pharaoh and Furystoke Giant. 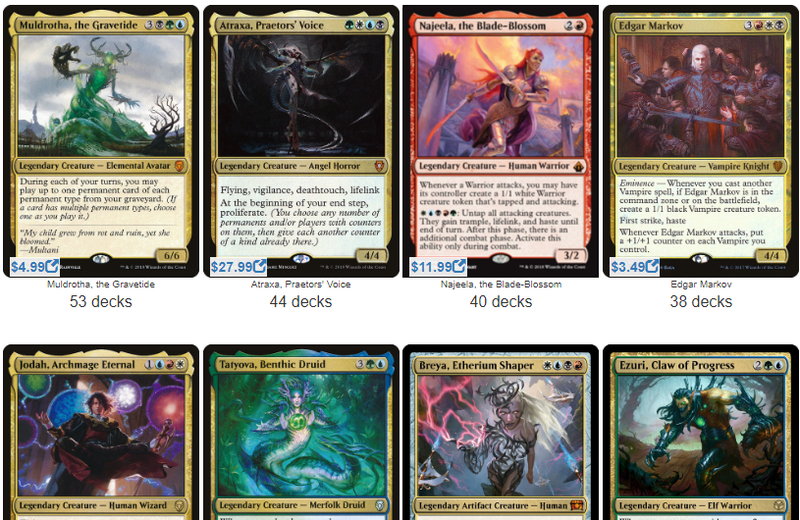 Both work great together and fit into those weirdo’s decks who don’t want to run Najeela as 5 colors. I like both of those, but I have a poor track record with making picks I think people should be playing versus what they are. 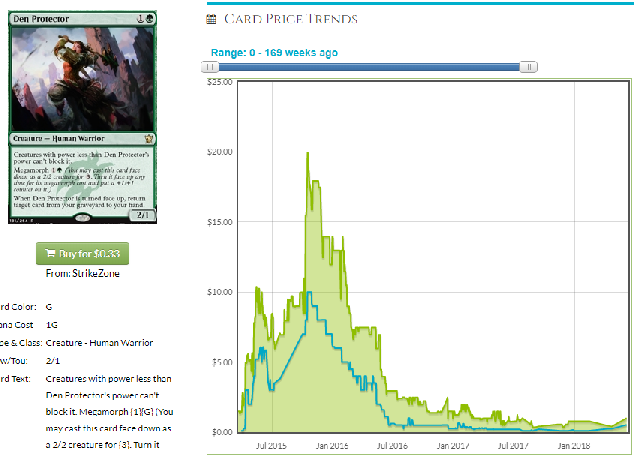 With EDH, we don’t really have to guess what people will do since there is enough time between tech being adopted and the price moving significantly that I think I am going to stick to leaving my opinion out of it. That said, being ahead of price bumps gives you a nice long while to accumulate copies without triggering someone’s notice when major stores go out of stock and if Najeela doesn’t pop Furystoke, maybe something similar in the future will and you’re already sitting on a pile. It’s riskier but speculation should be fun sometimes. Ya, I can’t help but get excited about cards I like. I’ll probably snap up every NM foil copy of Furystoke under $6 that I see. Shadowmoor is getting to be an oldie at this point after all. Anyway, thanks for your insight!! Being new to the finance side of the game I’m trying soak up all the advice I can.